The silver award with an average score of 82/100 from the five judges was given for this picture of a saguaro cactus taken just out of Scottsdale which I entered for the Landscape Division. I hurriedly worked on it to meet the entry deadline the day after getting back from my jaunt to Sedona over the Thanksgiving holiday weekend. Prints of this saguaro cactus with various finishes are available at my Imagekind store. The bronze award with 80 points was given for my photo of Lesli which I entered for the People and Portrait Division. 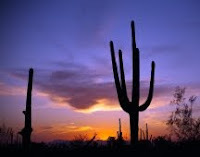 My third entry was this photo of saguaro cacti at sunset which I entered for the Landscape Division. It got 69 points overall.